Hong Kong mobile network operator SmarTone has unveiled Kissco, an end-to-end mobile marketing platform incorporating Kiss Pay, a mobile payments service based on NFC and ultrasound technology, a Kiss Dollars loyalty program and Kiss Beacons to allow retailers to send out offers and promotions directly to customers’ smartphones from their stores. UnionPay International will be the first credit card association to support the platform, allowing customers to store their credit cards within the Kiss Wallet to make purchases at participating retail locations by tapping their phone against a dedicated Kiss Retailer Terminal that is plugged into the retailer’s point-of-sale. The service is expected to become available to consumers “shortly, when a critical mass of retailers and outlets become Kiss partners,” according to Kissco, and will support both iOS and Android. “It is available free to all consumers across all cellular networks and on Wi-Fi,” the company says. “Kiss Pay enables customers to pay, redeem and be rewarded for their purchases with just one tap. Customers can store their credit cards, cash, Kiss Dollars and retailer cash credits safely in the Kiss Wallet. “We use both ultrasound and NFC technology for in-store payments,” SmarTone told NFC World. “We use integrated ultrasound and NFC technology and, hence, Kiss users can have the best of both worlds. 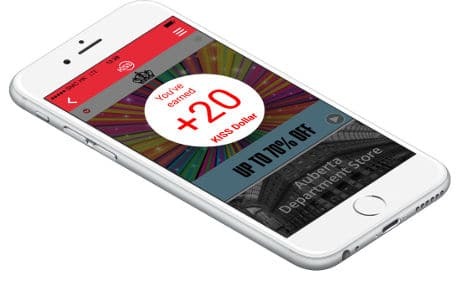 “Kiss Dollar is a universal sales promotion digital coupon that gives cash off with every purchase at all Kiss retailers,” the company continues. “Consumers get rewarded with Kiss Dollars in a number of ways, such as when they use the free app, check in at a retailer, engage with products and purchase. “Retailer Cash Credit is an optional retailer-specific and branded digital voucher that rewards customers for spending at that retailer. Every time they purchase from that store, they receive a voucher which automatically delivers cash off their next purchase. “When consumers are nearby a Kiss retailer, the Kiss Beacons trigger tailored proximity messaging that can deliver a welcome-upon-arrival greeting as well as receiving relevant information when consumers interact with highlighted products and get rewarded. Retailers have at their fingertips an easy-to-use tool that delivers powerful data and insights to improve consumer targeting and drive sales. “I see this as a game changer for brick-and-mortar retailers as they battle for market share,” says Douglas Li, CEO of SmarTone. “Kiss enables retailers to have an effective O2O [Online to Offline] platform to drive customer engagement and sales online and in-store. “Kiss puts the power back in the hands of the retailers and delivers tangible added benefits to their customers. Consumers demand convenience and security when they shop and pay for products. Kiss Pay and Kiss Wallet have been developed with the highest level of security, data privacy and protection in mind. “There is no other solution like Kiss that gives every Hong Kong retailer, big or small, the opportunity to stand out from competitors, engage customers along the full path-to-purchase and ultimately win a greater share of the customer wallet,” Li added. The unveiling of the Kiss platform comes a week after Hong Kong Telecommunications (HKT) launched a SIM-based NFC mobile payments service in the country. SmarTone introduced its first beacon marketing service in October last year and participated in Hang Seng Bank’s NFC mobile payments service in November 2013.